Ice Cream Professional – That’s Me! Behold the above photograph, which shows two scoops of frozen raspberry yoghurt, freshly churned and beautifully executed. If I may say so myself. You can also see the churning bucket (right of picture) and the rest of the “fro-yo” ready to be popped into the freezer for later. Time taken to make this healthy and delicious treat? Oh, about three minutes. The Cuisinart Ice Cream Professional did the rest of the work! I’ve had the Ice Cream Pro for a few months now and I’ve made about ten different types of ice-cream and frozen yoghurt – peach, chocolate (amazing), seville marmalade, vanilla, raspberry, and so on. All have turned out spectacularly well! 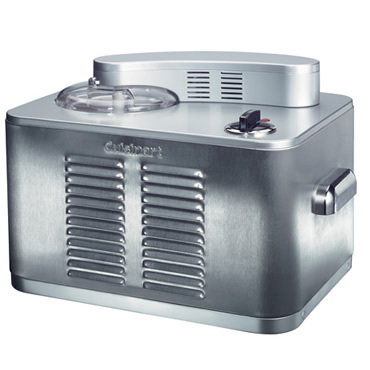 I have used another ice cream maker before (John Lewis) and it was a right faff. You had to freeze the churning bowl, then do something else, then stand on your head for three minutes and sing the national anthem. Only then could you put your ice-cream mix (or “custard”, for those in the know) into the machine. The Cuisinart machine has a built-in freezer so there’s no prep time – just pop your mixture into the bucket and turn the dial! Now I will say this: the colder your mix is, the better it will turn out. Warm mix doesn’t really produce great results. So, if you’re making an actual ice-cream custard, you have to chill the mixture right down before popping it in to churn. 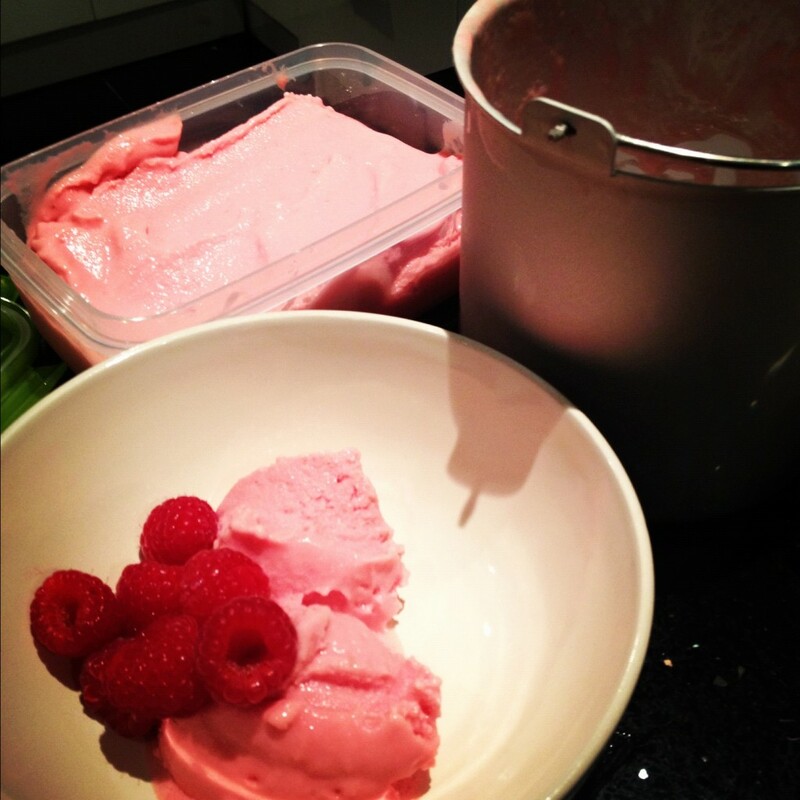 Frozen yoghurt can be poured straight in – you just blitz the fruit, yoghurt and a bit of sugar and it’s ready to go! Depending on what you’re making, the freezing/churning times vary from about 35 minutes to an hour, but if you try to over-do it and set the timer for too long, the machine automatically stops. I thought that this cut-out function would actually turn the machine off, but it doesn’t. (At least, it doesn’t for me!) The mixture gets thicker and more solid until eventually the machine can’t churn it and the whole churner and lid just comes popping off! It then makes a noise like a tractor stuck in the wrong gear until you run over, screaming, and switch it off. Aside from the noise issue (Mr AMR makes me churn the ice-cream in the laundry/junk room, with the door closed! I can oft be seen ascending/descending the stairs with my pail of ice-cream, like a disgruntled Swiss mountain girl) this machine is pretty darn brilliant. Serving up your own ice-cream concoction at a dinner party is so easy, but it also looks as though you’ve gone to an enormous amount of effort. I’d thoroughly recommend getting one if you like to have people over for dinner, or if you are an ice-cream addict, or if you have a house full of children. Homemade ice-cream has none of the crappy preservatives that most brands have to pump into their recipes in order to make it safe to sell, or last long enough to sell. No artificial flavourings, colourings, additives – just cream, milk, fruit, chocolate, perhaps an egg here or there.. Sugar, of course, but we all know that ice-cream’s not the waistline’s best friend! A little of something good, though, is uplifting for the soul – and better that it’s homemade and fresh. If you want to see me making Peach Frozen Yoghurt, then have a look at my recent cookery video!